April 22, 2016 is Earth Day. It is a day to celebrate and give thanks for God’s creation. Earth Day also provides the opportunity to reflect on small-scale farmers in nations of the global south whose lives and livelihoods depend on a healthy, vibrant creation. In many parts of the world, farmers who work the land everyday to sustain their families struggle with food insecurity due to arid soil and an uncertain climate. Presbyterian World Service & Development is committed to environmental stewardship and caring for creation. Through support for PWS&D, we help farmers restore creation and manage environmental change. Together, we are helping people like Elida Mwalwanda. Elida is a farmer from a small village in Malawi. Where she lives, prolonged drought has made it difficult for her to keep her crops hydrated. Last year, the dry weather was unrelenting and Elida grew anxious. In order to survive, she would have to reduce the number and size of the already small meals her family was eating. More and more, Elida was hearing about an environmentally friendly farming method called conservation agriculture. 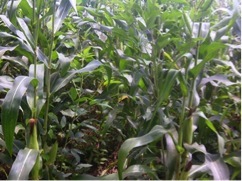 Conservation agriculture helps soil retain moisture and nutrients to increase crop yields. Instead of tilling the land, it encourages digging small basins in the soil, which are then filled with organic fertilizers and covered with mulch. The process seemed so different to Elida yet she was eager to try anything that would help. She signed up with the PWS&D-supported project in her village and started using the new method on all three of her plots. Elida was amazed at the results. With conservation agriculture, her crop yields nearly doubled. Her parcel of land was transformed—fertile soil and lush, green stalks of maize replaced brittle, shrivelled husks. At that moment, Elida knew her way of farming had changed forever. At the local fair that year, Elida was named one of 10 outstanding farmers in her community. Elida was proud that she had taken a chance with conservation agriculture. By protecting the soil and using organic fertilizers, she expects abundant yields for years to come.